I wanted to give my book an olde worlde feel, so I am tearing the edges of all the pages and staining them with tea. The stack of pages in the picture are the ones I have torn so far, and the top sheet has been tea stained to see how it turned out. I was happy with the result. The colour is just what I was hoping for and the paper dried with a crispy, brittle feel to it, which I think helps it seem older. 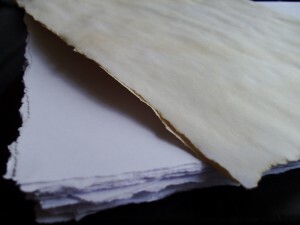 So far, I have torn the edges of 36 sheets of A3 paper and stained one of them. I plan on making a 500 page book, so that leaves 214 sheets to tear and 249 to stain. It’s slow and time consuming, but hopefully it will be worth it when I have a beautiful, hand made tome to satisfy my obsession. Another way you can achieve old notebook pages is to burn the corners using a lighter. 🙂 I used to do this when I submitted projects back in school.